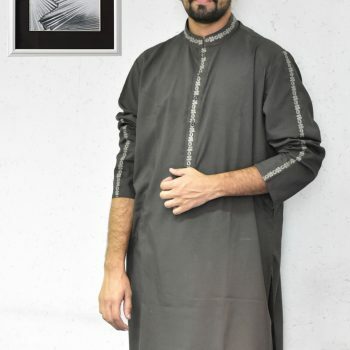 For male salwar kameez suits, Faisalabadfabricstore.com have used cotton, Karandi, khaddar, and wash-and-wear for black salwar Kameez of men. 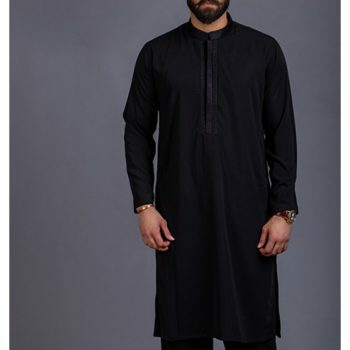 The fabric is best to wear as daily wear and also casually on different special days such as Jumma prayer, Muharram Majlis, and other ceremonial events. Moreover, Black shalwar kameez design for the male has also been festooned with masculine patterns of thread art. Esthetic patterns of needlework are traced around the collars, necklines, back of the shirt and on upper front sides. Different kinds of motives have also been placed in some articles. 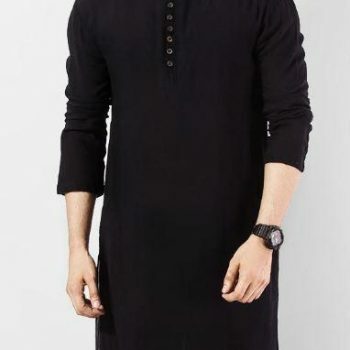 Don’t think that having embroideries or artwork on men kurta makes it look sassy or girlish in fact very elegant and lightweight filigree has been placed to make them look equally impacting and manly. 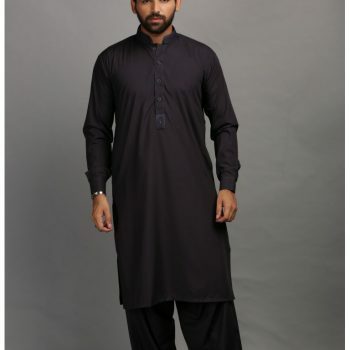 Faisalabadfabricstore.com is a reliable source in stitched/ unstitched black shalwar kameez suits for Men. We deal in best fabric for the men like wash & wear, cotton, poly viscose, linen, Karandi & khaddar suits both embroidered & non-embroidered form. Moreover, we also manufacture the men colorful kurtas as party wear in various fancy variety fabric like Jamawar, silk, & cotton sateen. 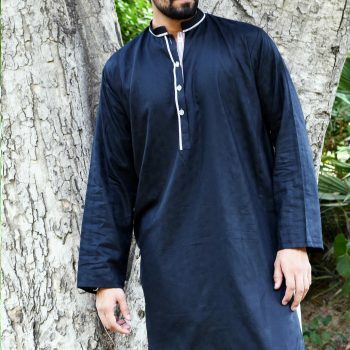 We are Top retail sellers of gents black shalwar kameez, kurta pajamas, and ship both in Pakistan & out of Pakistan & simultaneously deals in wholesale men black salwar kameez/ salwar kameez suppliers & stitched designer replicas of ladies shalwar kameez and we deliver all over the world with top class stitching with very flexible MOQ for wholesale. Last but not the least, to order these beautiful salwar kameez suits for male and female, you can use the option of COD and advance payment. If you want to purchase one or two articles, COD option would work anyhow for bulk order you will have to use advance payment option. Faisalabad Fabric Store is presenting one of the finest quality fabric based on lawn, linen, and chiffon for black color ladies’ suits. This fabric is best to wear in the mild seasons when there is neither hotness nor cold. Not only this, the fabric is also high in quality that after many washes, it won’t lose its strength and esteem. If we talk specifically about black color ladies suits, they are enhanced with modern artistries of threadworks, embroideries, and needle art done by using sewn machines. Along with this, numerous kinds of jewels, beads, and stones have also been used on the front side of daman, around the neckline and oversleeves and making it one of the most engaging and beautiful black salwar kameez collection. Moving on, in this beautiful black salwar kameez collection by Faisalabad fabric store you will have different color combination options such as Black and pink combination churidar pajama with Anarkali frock, black and pink combination salwar kameez and black pink salwar kameez. 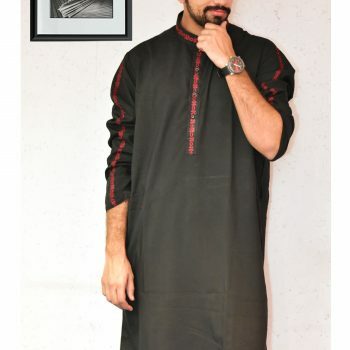 For males, we have black and red combination salwar kameez and red, white and other luminous combinations.